Journey to New Hampshire Homestead: Storm Comin'! Proof that turkeys do get cold feet. Notice how they are standing on one foot, warming the other up against their body. We are forecast to have a major snowstorm starting later tonight. With possibly over 2 feet of snow, and 60 mph wind gusts, it is going to get rather nasty out there. The wild things know. There was quite a bit of bird activity at the feeder today, as if they are trying to eat up and be ready..
We have extra gas for the generator, plenty of wood and kindling, and matches for the woodstove. We have propane for the cookstove. We have flashlights, and extra batteries, with rechargeables and a charger that can run on the generator, or the car battery inverter) and the oil lamps with plenty of oil. And a pantry stocked with the necessities. I think I will make a big pot of potato soup in just awhile. So, the self sufficiency model of homesteading is practical, and gives a great sense of security and calm, even with a storm raging outside. And if the storm turns out to be a bust (doubtful) then, no matter. We just continue our routine. Here is a great method of preserving pantry items that I've started using quite a bit. It is called dry canning. It is ONLY for DRY goods- things like pasta, rice, flour, cereal, coffee, tea, dried fruits or veggies -things like that. Most of my pantry space is in the cellar.... which can be humid, and which also has a few resident mice. So i must protect foods from both the moisture, and the mice. Glass jars are mice proof, but could still allow some moisture. 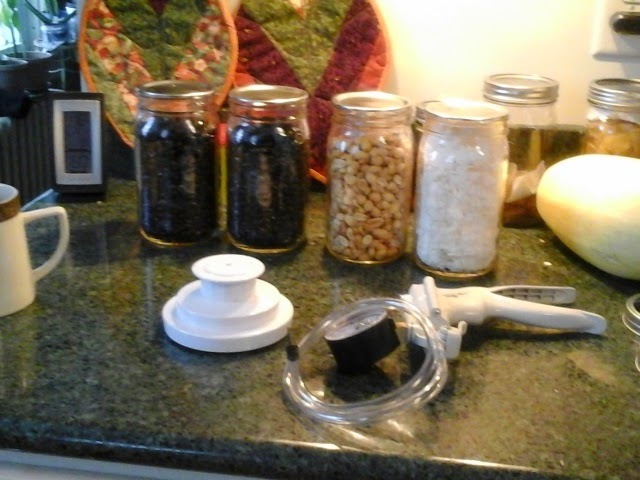 Enter, the vacuum seal jar attachment for a food saver machine, and a simple manual vacuum pump. Here are some jars with a few things I want to seal up. A friend gave me some coffee (yay) and some peanuts. The last jar is some dried coconut that came jn a plastic bag... definitely not mouse proof! 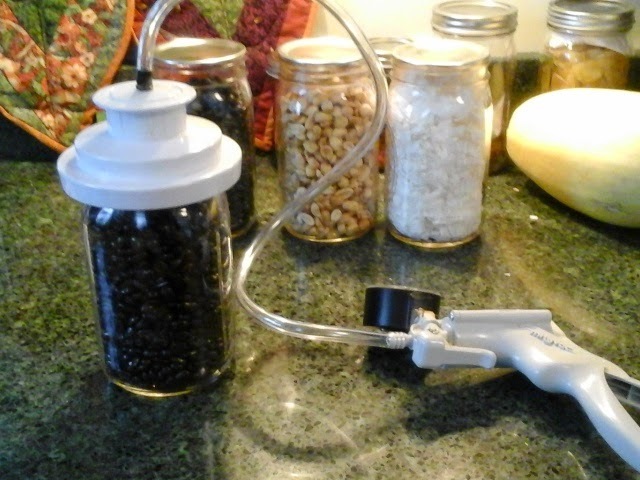 And there is a the jar attachment, and the vacuum pump. Just pop the jar attachment on the jar with only the lid, not the ring. The vacuum pump has a gauge. I aim for the 20 on the gague, as that is what the foodsaver machine will produce, if you are lucky enough to have one of those. That's all there is to it! The manual (ie. hand cranked) pump is a little bit of work. You will get some stronger forearms. But what I really like about this method is that, since I am not heating the jars, the lids can be re -used. And it does keep out mice and moisture! This puts a seal on the jar same as if you had used the canner. Tips: I often use some of those silica dessicant packets, especially for dried friit or veggies as extra moisture control. An oxygen absorber will also produce a vacuum seal on the jar wjth no work on your part. But they are a single use, so I tend not to use them. Weather. Was zero this morning. Now in the teens. Hasnt started snowing yet, but the sky is heavy.... we can almost smell snow in the air! His thunder announces the coming storm. Even the cattle make known its approach. Hey Chris! We are hunkered down, warm and cozy! Snow should start soon. Jope things are well with you guys! We are hanging in there. Jenn came home on Friday and is trying to get adjusted back to normal life. Keep us updated!